A continuation from the previous post on Monday. What’s an anniversary post without some flashback photos? The photographer was a close friend of mine and because of that, we were very comfortable in front of the lens. Maybe a bit too comfortable. Ha! Can you feel our excitement? 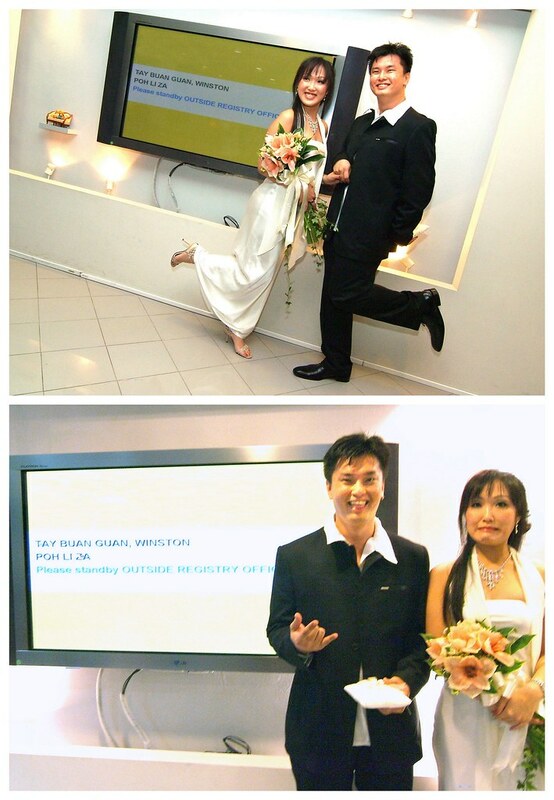 2008: Wedding dinner at Grand Shanghai. 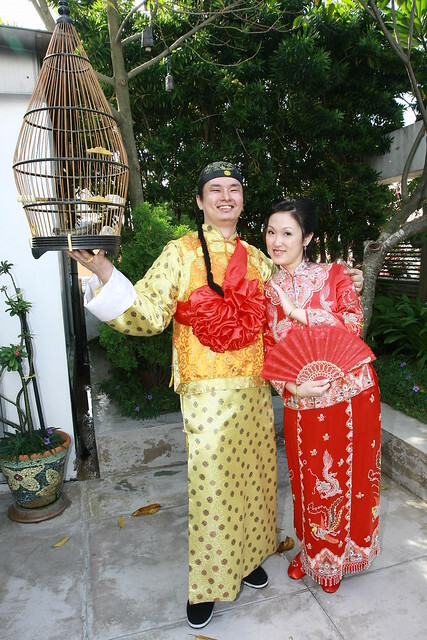 Master Zheng taking his morning stroll with his lovely bride. I love my kua you know? I LOVEEE my rented kua. It’s so red and so cheena. I LOVE IT! You can’t tell from the photos but the kua made me very ill that night. The weight of all the embroidery sitting on me for so many hours in the blazing hot sun made me dizzy and nauseous. By the time we went back to the hotel to rest before the dinner, I was running a high fever and delirious from the fever meds. Oh yes, did I mention I was also about 4 months pregnant and due for a keyhole procedure for my endometriosis the night after the dinner? It was a crazy day. Sapu all the drama into one night. We rolled into restaurant to the tune of Jajambo by the live band. The rickshaw was not part of the restaurant’s decor. My sisters and brother-in-laws borrowed it (and also decorated it) from one of their clients especially for the night. 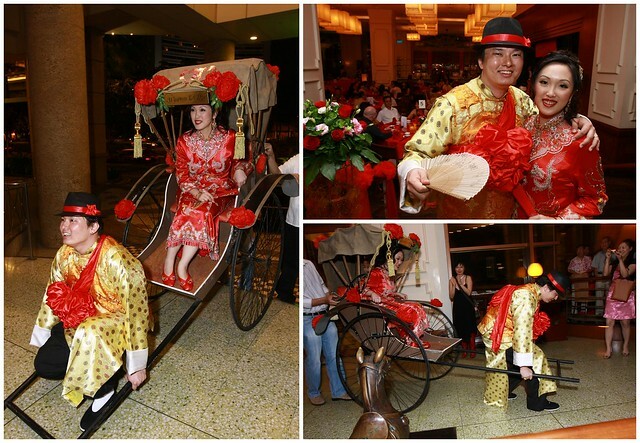 When they heard about the dinner theme week prior, they immediately went and made arrangements to bring the rickshaw there with the manager’s approval of course. I have to say lah, we managed to make the stoic but professional manager smile quite a bit that night. It was a dizzy, noisy and happy night for everybody that night. 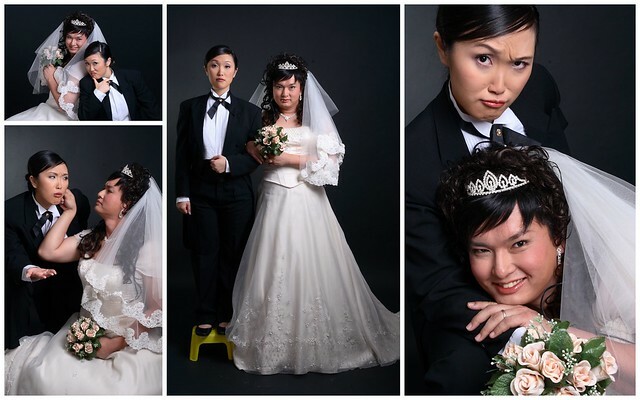 2008: Studio shoot at some ching cheong photo studio in Jurong. A must-have among many Asian couples. My eldest sister paid for the expensive album as a wedding gift to the 2 of us. My childhood dream of wearing a large poofy dress was finally realized! Excited! 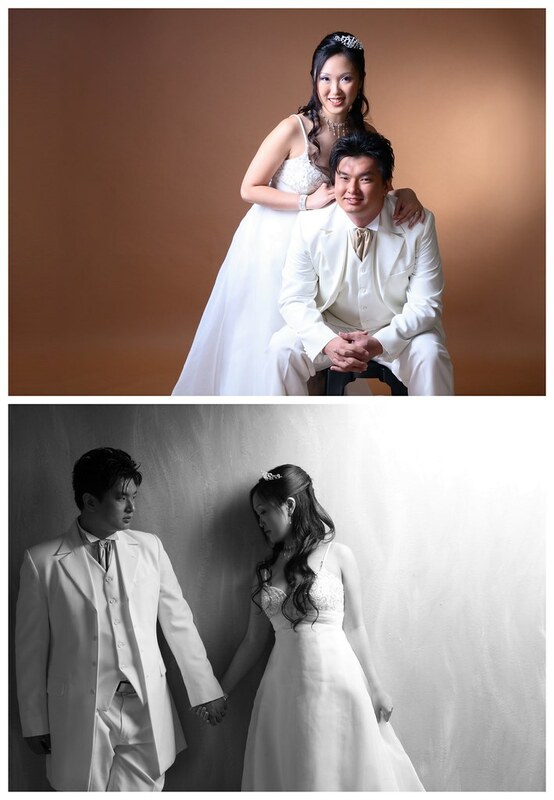 We did the shoot a few weeks before the wedding dinner and started at around 9am, ended around 10pm. Since it was not an exclusive all day session, we had to wait around while they take on other clients in between takes. Throughout the whole day, I was determined not to drink more than 1 cup of water because I didn’t want to pee in the big poofy dress inside the tiny dirty public toilet waaaaaaaay outside the studio. I was starving and had a super sore stiff neck during the shoot. I couldn’t turn my head at all without screaming laughing out in pain that’s why some of the poses looked so er… regal. Outdoor running in the fields shots were out of the question so we made full use of the studio session as best we could. 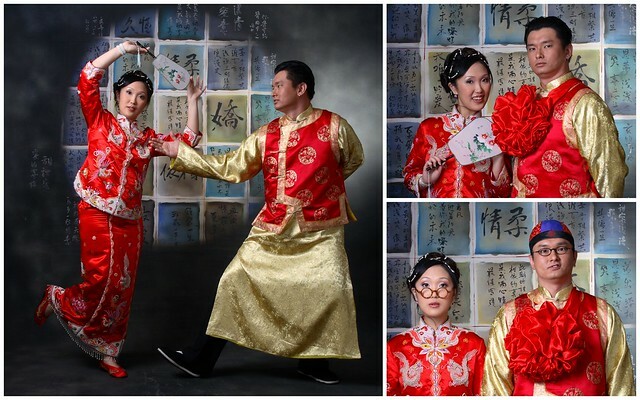 Lucky for us, the makeup artist and photographer were very friendly and accommodating. The 12 hour session could have been such a pain in the neck. Pun intended. I loved that gold dress. I can outrun you for the bus in that thing. The “lingering look” pose took the photographer about 2 minutes to shift my head in order to look natural. Then the poses got a little interesting. The Husband started to rummage through their accessory baskets for ‘props’. So how? What do you think of my bride? Seksi hor? Leave a comment or two can? Nail polish can make you gay! As with any child if his age, Xander is quite a curious boy. He has questions for everything and would try (almost) anything. We try to answer him as best as we can but sometimes if I don’t know the answer, I usually make one up and indulge him. Me: Oh that Uncle dyed his hair red. Me: I don’t know. Maybe he wants to be an Ang Mor? Me: You know what is an Ang Mor? No? Ang means Red in Hokkien, Mor means Hair. Together you get Ang Mor lor! Xan gave me a polite giggle, shakes his head and ‘tsk’ + ‘aiyah you ah’ to me. He didn’t get the joke but can respond to my reply quite accurately. By 3.5 years old, he now know his mardder is a blarddy joker. Ok ok. I’m getting to my story now. A few weeks ago, we were invited to a distant relative’s wedding dinner. Few nights prior, I took a good long look at my stubby toes and muttered to myself “Wah lau, so ugly. Better paint them now while there’s time and since I’m going to wear sandals.” So I painted the toenails and forgot my fingernails. Typical. Anyhoo… While I was slapping on some hot pink polish, I suddenly remembered a scene from an early episode of Jon & Kate plus 8. Kate Gosselin was reminiscing when Colin (one of the sextuplets) was fascinated with her painted toenails. She said “he would just come up, and I would feel a little petting on my feet.” At that moment, I wondered how would Xan react? So I tested it out the next morning. We sat in the living room and I nudged him to look at my newly painted nails. Me: Psst! Nice or not? Xan: *eyes open wide” Waaah! *tries to touch a nail thinking it was still wet* Why you put colour on your toes? Me: Because mummy hiao (Hokkien for vain). I want my toenails to look nice. Nice or not? Xan: Nice! I also want colours on my toenails. I want yellow, blue, green! Me: Ok, but I only have white and pink. Me: Ok, I’ll paint ONE toenail. If I paint more, your teachers are going to think Mummy is mad and call me in for a private meeting. I don’t have a problem with boys playing with nail polish & earrings. Just don’t touch my knickers. The Husband had painted nails and wore earrings (manly loops) for quite a while until a few years ago when his job required him to look more …ahem… serious. See here and here. Its the folks around me that have problems with it when I told them about painting his nails and his love for fresh flowers. “He needs more manly contact. Make some more boy babies!” Okok, I made this one up. You get the point lah. What’s wrong with boys with nail polish anyway? You can’t turn gay from using nail polish, getting ears pierced, grown long hair, get facials, drink Shirley Temples, listening to Air Supply or cry at weddings. Don’t be goondu! Wah lau! Which cave from which century did you crawl out from? A little feather boa will bring a smile to any child. Kids NEED to play dress up. It helps to build confidence, exercise their imagination and even strengthen their communicative skills through role play. Not I say one. Experts say one. Homophobes should learn to relax a little and just let the kids enjoy their childhood without being influenced by the crazy gender stereotypes. So folks. Relax! Let them play! The kids will have plenty of chances to dress properly later in life so let them be and have some fun. Dressing up as the cast of Jersey Shore. Yea or Nay?